In this season’s fashion week, Carolina Herrera showed us that she can also adapt to a volatile market. Her point of view has always been impeccable elegance, layered with romantic apparitions. 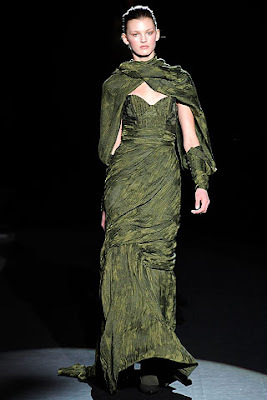 But for her Fall/Winter 09 collection, she introduces a new element to the usual Herrera ethereal sway flirting down the runway. Her muse appeared smarter, rougher, and ready to face any adversities coming her way. The fashion designer integrated much versatility in this collection that can withstand the urban ruggedness that perhaps her previous collection had never encompassed before--with gowns that are coupled with seperate dolman sleeves almost to mimic an armor (right). I was inspired. Many of the gowns had a layering effect that were much cleverly installed to appear simply as one piece. 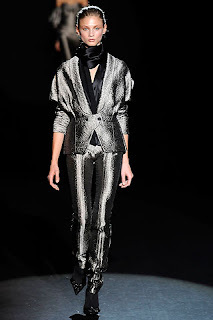 Her suits were sleek with a sheen, often shown in metallic colors (left). She used lots of coppers rather than shades of gold, again adding to more of an urbanized finish. And lastly as you watch the whole collection below, take notice of the accompanying music that was chosen. Well into the climactic point of the show, the music begins to echoe a feeling of women in battle-- as though it is the theme lyric for rejoicing each of her muse's strengths while morphing into this inner warrior that calls upon her today.